With just a few clicks, you can set up customizable WordPress backup schedules so backups will run automatically. BackupBuddy, the WordPress backup plugin, makes “set it and forget it” backups of your WordPress website an easy process. Why is it important to schedule WordPress backups? A WordPress backup strategy is important for protecting your WordPress website against unexpected data loss due to user error, server crashes, hacks, malware and more. But what good is a backup if it is out of date? Scheduled backups are an important part of a solid WordPress strategy because they run automatically, backing up changes to your website so you always have a current backup. By scheduling backups to run automatically, you can get back to other website management tasks such as blogging and adding new content. To start scheduling your BackupBuddy backups, you’ll need BackupBuddy, the WordPress backup plugin. One of the great features in BackupBuddy is the Scheduled Backups feature. 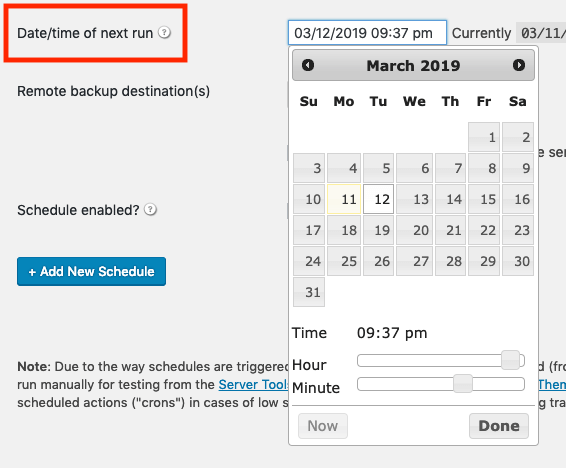 With WordPress backup schedules, you can set backup schedules to run at customizable intervals. 1. After installing and activating the BackupBuddy plugin, navigate to BackupBuddy > Schedules in your website’s admin dashboard. 2. 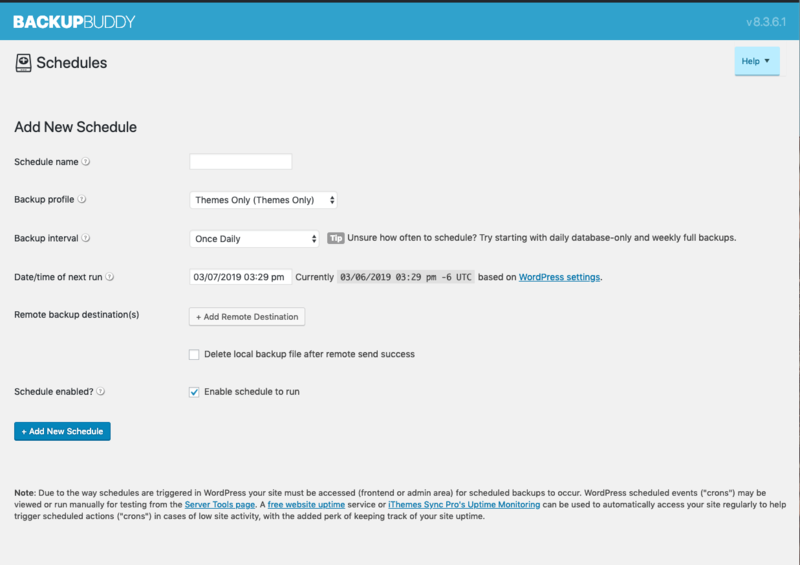 Once you’ve landed on the Schedules page, start the schedule WordPress backups process by giving your new backup schedule a name. 3. Next, select the Backup Profile you’d like to schedule. BackupBuddy’s backup profiles allow you to customize the type of WordPress backup that will run. With BackupBuddy’s backup profiles, you get granular control over the contents of your WordPress backups. You can really backup as much or as little as you want with each backup profile. Note: BackupBuddy comes preloaded with smart backup profiles to backup themes only, plugins only, media files (for just backing up those parts of the site) or database only and a complete backup (to backup everything in your WordPress installation). Backup profiles also make it easy to back up various key areas of your WordPress site separately ‘out of the box’. For example, you could create a new Profile called “Everything but media, plugins, and themes” and set it to back up everything else on the site easily. Individual Backup Profiles for Themes, Plugins & Media – Backup various portions of your WordPress site to break up backups or download zip files of these key areas of your site. Create Custom Backup Profiles – Create custom backup profiles with an initial backup type of full, database only, any smart profile type, or custom files for a blank slate. You can also create custom profiles with optional custom backup root to only backup a specific directories. Backup a Specific Directory (Even Paths Outside the WordPress Directory) – Use a custom backup profile to backup a specific directory. This can be one of the default profiles in BackupBuddy or one that you created yourself. Note: Want to add a custom backup profile to run You’ll find the new Smart Backup Profiles on the BackupBuddy > Backup screen. 4. Once you’ve selected your profile, set how often you’d like the backup to run. Your WordPress backup schedule can be daily or yearly and everything in between. How Often Should You Schedule a WordPress Backup? Unsure how often to schedule? With all these schedule options, you may be wondering how often you should backup your website. The answer is: it depends. A good rule of thumb is that you should be backing you your site often enough to keep up with changes to your website. For example, if you have an e-commerce website with frequent sales, you should probably be backing up your database once hourly. For most websites, we recommend starting with daily database-only and weekly full backups. If your site isn’t very busy and mostly static, you can set the schedules less frequently. For instance, you could schedule a full site backup for once a month and a database backup once a week. If your site is busy and has frequent changes, you’ll want to set these scheduled backups to run more often. Have a super busy site? 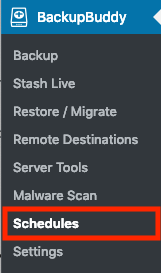 Check out Stash Live for automatic backups of the website’s database changes as soon as they happen! 5. Once you’ve set how often you want the backup to run, you’ll set up the date and time of the first backup to run. 6. The next option is whether or not you want to send this scheduled backup to a remote destination for storage. By default, all BackupBuddy backups are stored on your server. But you can send your scheduled backups to a remote destination and have the backup automatically deleted from your server once the backup has been sent successfully. Just be sure to check the box to delete the local copy of the backup if you want to delete it. 7. The final step before hitting the Add New Schedule button is to enable the schedule. 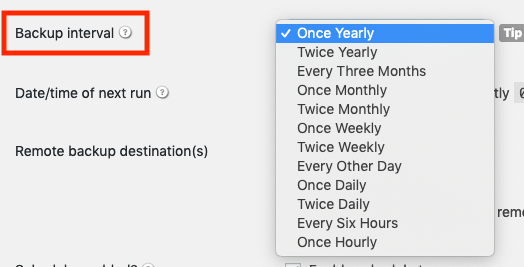 If you don’t select this option, your scheduled backup won’t run. If you need to temporarily disable a schedule for any reason and don’t want to delete it, you can just uncheck that option. Due to the way schedules are triggered in WordPress, your website must be accessed (frontend or admin area) for scheduled backups to actually occur. WordPress scheduled events (“crons”) may be viewed or run manually for testing from the Server Information page. A free website uptime service can be used to automatically access your site regularly to help trigger scheduled actions (“crons”) in cases of low site activity, with the added perk of keeping track of your site uptime. Need More WordPress Backup Schedules? There is no limit to the number of WordPress backup schedules BackupBuddy can run on your website. We typically recommend creating both a complete full site scheduled backup and a database scheduled backup. Again, how often you set these to run depends on how busy your site is. Go ahead, schedule another WordPress backup! BackupBuddy is the 3-in-1 WordPress backup plugin to backup, restore and migrate your WordPress website.